Note: Slideshow functionality is disabled by default so you may not see this functionality in your Asset Bank. Once enabled the slideshow can be accessed from any search results page, any browse page or the lightbox. A 'view these images as slideshow' link should be present at the top right of the image results on any of these pages. 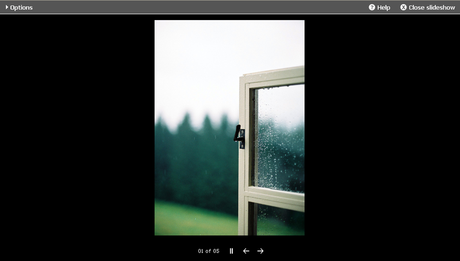 You can also show a slideshow of only selected images in the Lightbox. Simply tick the images you want to include in the slideshow then select the 'view as slideshow' option from the 'Actions...' dropdown list. In any instance the slideshow will start up and images on the slideshow will be presented in the same order as they appear on the browse/search/lightbox page. Once the slideshow has loaded there are a number of changes that can be made to how the slideshow is displayed from the drop down 'Options' control panel at the top of the page. You can tick attribute values to display below the images in the slideshow (the title or id of the image for instance). You can decide whether to show labels for these values and you can specify the duration in seconds that each image in the slideshow should display for. Once you have made these changes you need to click the 'Apply' button, at which point the slideshow will restart reflecting your new settings. The number of the image currently being shown along with the total number of images is displayed at the bottom of the slideshow next to the display control buttons that can be used to pause and play the slideshow and manually cycle through the images.